The popularity rat race. ~ Smithankyou - Lifestyle and Travel Photo Blog. Some of my clients had ask me this very silly question about whether I am considered a popular blogger or so call famous. 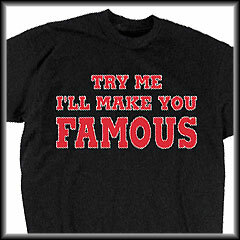 My question is what makes you popular and famous ? Is it the number of read/clicks you get per day? Is it the number of followers you have on twitter or likes you get on facebook? Like seriously, wake up already. "Social Media - Everyone has a voice but not everyone has a brain." We all know who are the people we read online and who are the good to follow on twitter especially for me as a marketer who lurks around local social media scene more than anything else. I prefer to use the word "active" to describe most people who have good numbers of followers/readers/likes on any of the platform. It's about you being active to get certain amount of support in your own sub-culture. It's just like how well people know your mother in your neighbourhood wet market. Maybe 90% of the store owner knows her but that doesn't make her famous cause her going to a new market might not have this good % of support too right? So if you ask me who are the really famous one locally ? I will only give you two names. Xiaxue and Mr.Brown. It's only when you can be recongnize by the world or being mentioned by the minister during his speech. That is famous. You see, I do not even need to hyperlink both of them and I'm sure you know their sites. "We always say that u need to be famous to have haters but it's not a 2 way road.Stop trying hard to gather haters to prove u r famous. " Reversing the process doesn't work. Seriously. To sum this post up, social media to me is really social and social is about making friends and not gathering minion to make yourself popular. Stop all the check score on social media. Followers/Friends/Likes are friends NOT FOOD(for your ego). Mr.Smith, don't get trapped in your own little rat race.